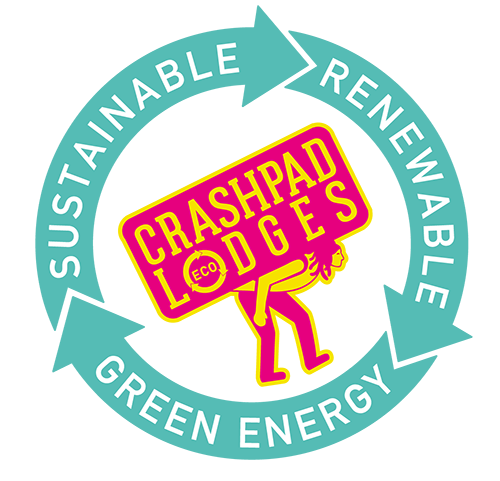 Looking after our environmental footprint is very important to us at Crashpad Lodges. Every year we help families, friends and groups to enjoy the beautiful surroundings that Snowdonia offers and to ensure that its stays beautiful for generations to come we have introduced measures to ensure we do our part. Being off grid with no access to mains electricity would usually involve using a diesel generator to power remote accommodations which is not only a heavy air pollutant but loud, disturbing the local surroundings. Instead we have installed a state of the art off grid system. This system powers the Lodge through Solar Panels on the roof, a wind turbine on our ground, even our water pump is powered by its own solar panel. We have a suite of batteries which holds the energy created to power the lodge. On the very rare occasion the batteries run low we do have a new small low impact generator which steps in temporarily when needed. Crashpad Lodge is only fully accessible (to the door) by 4 x 4 vehicles. We do have a permit to park up-to 4 cars on nearby land 1km away. This is to keep the disturbance of the land to a minimum and to respect the surrounding farm land which is home to welsh hill sheep, ponies and Highland Cows. The wildlife is very rich and varied with Buzzards, Kites, Songbirds, Wagtails and sometimes Eagles. To ensure we give back to our local community we employ only local tradesmen and staff members. We honour the Welsh history of the property named Helfa Fawr through all of our marketing channels and story telling with the aim of preserving its long life for the use of others for many years to come. We actively support Snowdonia Giving which is a non profit charity raising funds to help preserve Snowdon and her surroundings for all to keep on enjoying.